In the spring of 2014, Leppert started writing a blog. It was the usual kind of blog being written for the usual kinds of reasons. But a funny thing happened when he took a couple of risks with his writing: he got away with it. And then he took his gloves off for good. 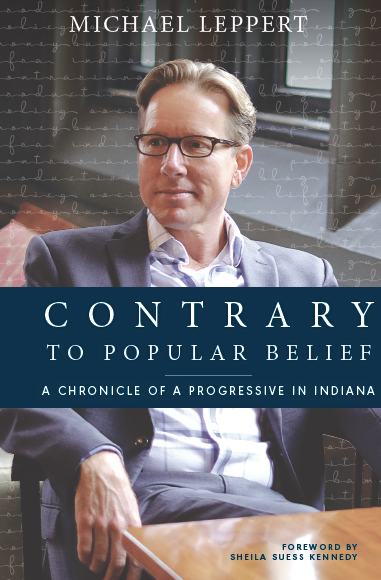 Within a year, his “blog” was elevated to a “column” and began showing up in mainstream publications throughout Indiana. After publishing more than a hundred installments, a group of recurring political and cultural themes began to emerge. From RFRA and guns, to the economy and parenting, Leppert takes a provocative view on all of it. Contrary To Popular Belief gives the real reasons why and from where his opinions are based. It is a chronicle being released purposely in summer of 2016 for readers to use as a guide during a historically chaotic political season. Available July 8. Pre-order now.